Record reporter Daniel Jin’s ’20 excellent article on the first diversity and equity forum of the year merits discussion. Today is Day 1. 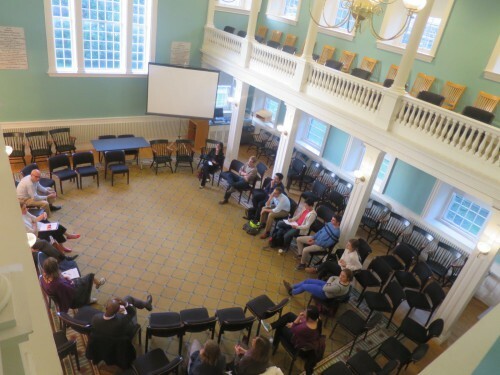 On Thursday, students and administrators discussed major campus issues at the first diversity and equity forum of the year. The forum was held in Griffin 3 and was hosted by Vice President for Institutional Diversity and Equity Leticia Haynes. Haynes began hosting the forums last year and plans to continue them this year. The article is well-done but not perfect. First, tell us how many people were there! The picture that goes along with the story shows 15, but perhaps it was taken early or late in the proceedings. Of course, even a forum with 10 (?) students may be worth running, but Record readers (especially trustees!) need to know if this is a topic that truly engages the student body. As best I can tell, it doesn’t. Students don’t really care about diversity/equity, or at least they don’t care enough to show up at a forum. Students raised concerns about the high standards and expectations brought on by the student culture. They said that many students feel the need to aim for perfection in all facets, a pursuit that can cause unnecessary and unhealthy stress. “It’s an absurd ideal, and it’s not achievable,” Natalie Wilkinson ’19 said. Recall Brandi Brown’s ’07 work on Eph-ailure almost a decade ago. (EphBlog has been around so long that a student who participated in that discussion is now a Williams professor!) My thoughts have not changed much. First, it is unsurprising that Williams students are stressed, competitive and fear failure. That’s what Williams selects for. If you are comfortable getting a C on a paper in high school, then you don’t get into Williams. You may be a happier, more well-adjusted person, but you won’t be hanging out with Natalie Wilkinson in Paresky. Second, I don’t mind a little stress and competition. I want students to be worried when taking a math test from Steve Miller. I want them to think twice before handing in something sloppy to Joe Cruz. Moreover, stress and competition require failure (or at least low grades). There is much less value in getting an A from Bill Wagner for a well-done paper if even sloppy work gets the same grade. Third, I worry much more about problems where one can make a plausible claim that Williams is worse off than other schools. Is there any reason to think that this is more of a problem here than elsewhere? I doubt it. Fourth, stress and failure are a part of life. Want stress? Try losing your job and still having a big mortgage to pay. It would be a bad thing if the first stress/competition/failure that Williams students encountered happened after they graduated. Did the forum define “diversity” and “equity”? If not, then it was a mere bull session.